That graph does indeed track the art market as a whole, especially the Contemporary art market in the same period. Not only does Warhol track the rapid rise of Contemporary art in 2006 and 2007, the post-crash stability of the Warhol market also reflects the steady sales of Contemporary art. This year, however, the Warhol market seems to have shifted dramatically at the top end. First half of 2013 sales reached $137m with only one work selling for more than $10m (though nothing to sneeze at at $38m) and dramatic drop off in prices further down. This Fall’s sales in New York and London might bring new trophies to the market but it seems unlikely that we will see anything remotely like the Autumn of 2010 sales when $200m worth of Warhols traded hands in a single week. And we’re surely not on pace for another $300m year. Instead, the Warhol market, perhaps driven by Christie’s liquidation of the estate’s holdings in multiple online sales, seems to be pushing down to much lower levels. If Warhol were a fashion brand, we’d describe this as the year of his diffusion brand, lower-priced merchandise that capitalizes on the fame and allure of the exclusive reputation. Adam points to two sales mostly of works on paper that were acquired directly from the Warhol Foundation that are now on offer along side the marathon Christie’s sale. Many wondered when the Warhol Foundation made its deal with Christie’s whether the works would flood the market and drive down prices. So far, the diffusion market has been surprisingly healthy. The top end has suffered instead. The question that remains is whether this shift to lower-priced works is a signal that the Warhol market is tapped out for now or a sign that the top end has pulled back so as not to risk any confusion with the ephemera on offer. More to the point, Warhol’s market is unique but is this shift to lower priced works a harbinger for the broader Contemporary market as a whole? 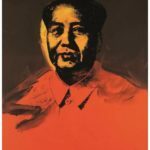 Is Tepid Hong Kong Sale of Warhol’s Mao a Sign of the Chinese Market’s Lack of Interest?